Easy Overnight French Toast Casserole is a simple breakfast recipe for a crowd that everyone loves! This whole wheat french toast casserole features a maple custard and light vanilla glaze and is perfect for brunch or Holiday breakfast. Gluten-Free and Dairy-Free Modifications included. Looking for more delicious breakfast casseroles? Try out my Easy Breakfast Casserole with hash browns, sausage, and eggs, or my Green Chile Egg Casserole. If traditional french toast is more your thing, be sure to grab my recipe for Classic French Toast. For the past year I have been serving breakfast to my church’s production team. The team had requested Gluten-Free Breakfasts and High Protein Options, so I had been opted to take them Sweet Potato Hash, Spinach Quiche with a Sweet Potato Crust, Banana Nut Quinoa Porridge, or Mediterranean Fritatta. I have so many easy, healthy breakfast recipes I can’t wait to make for them. But recently, the production team has gained some new team members and they have changed up their requests from light and egg-centric dishes to full-on carbs and so I decided it was time to bring them one of my family’s all time favorite breakfast casseroles–French Toast Casserole. This easy French Toast Bake has been made a bit healthier, in true style to A Mind “Full” Mom. Whole wheat bread has been swapped out for white bread and the egg custard is sweetened with maple syrup instead of white and brown sugars. But none of those healthier swaps matter if the French Toast Casserole is not delicious, am I right?! 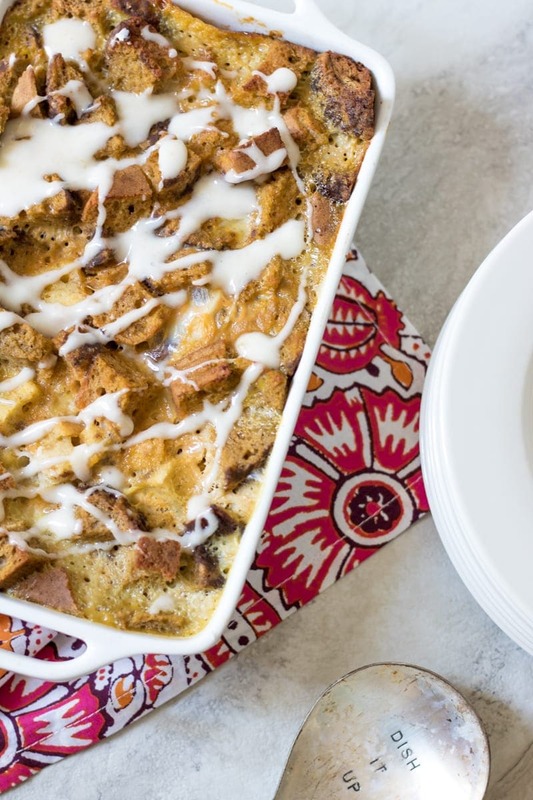 The verdict on this Easy French Toast Casserole Recipe? Only crumbs remain EVERY SINGLE TIME I serve it and people beg me for the recipe. The recipe for Overnight French Toast is so easy, it is almost embarrassing–But we all need easy recipes! Grease a casserole dish with butter. Cube up bread into 1 inch cubes and place into casserole dish. Whisk together an egg custard with eggs, milk, and seasonings. Pour the egg mixture over the bread, using your hands to gently submerge the bread into the custard. Cover your baking dish and refrigerate overnight. In the morning, remove your french toast casserole from the fridge and let warm up on the counter as the oven heats. Bake, covered for 30 minutes. Then remove foil and bake for an additional 15 minutes. You can serve this french toast bake with maple syrup and fresh fruit and it will still be delicious–but if you really want to take it over the top, whip up a simple glaze of powdered sugar and milk and drizzle over the baked french toast. What is the best type of bread to use in French Toast Casserole? I do not recommend thin sandwich style bread. You want thick bread that has incredible flavor all on it’s own. Traditionally Challah Bread or Brioche Bread is the choice for French Toast Casserole, but my whole wheat breads are incredible in flavor and make a great healthier swap. I use my homemade whole wheat bread or my homemade cranberry walnut bread. Ideally, any bread you choose to use needs to be able to be cut into 1 inch cubes and bread that is a bit stale (AKA dried out bread) is best so that it will absorb the custard (AKA the flavor). Pro-Tip: Save leftover scraps of bread or stale bread. Cube and place in freezer safe bag and then use that bread to make this delicious Overnight French Toast Casserole for pennies. Can You Freeze French Toast Casserole Before Baking? Yes, you can freeze French Toast Casserole Before Baking. First, be sure to assemble your Breakfast Casserole in a freezer safe and oven safe dish. Once assembled, wrap the dish in plastic wrap-2 times and then cover with 1 layer of foil. Freeze uncooked French Toast Casserole for up to 2 months. To cook, remove casserole from freezer day before you want to serve. Allow the casserole to thaw overnight and then bake as directed. Make the Vanilla Glaze and top with casserole if desired. Can You Freeze French Toast Casserole After Baking? Yes, you can freeze French Toast Casserole After Baking. Follow instructions on my Easy French Toast Casserole (minus the glazing step). After baking in a freezer safe dish, allow casserole to cool completely. Once cooled, wrap the dish in plastic wrap-2 times and then cover with 1 layer of foil. Freeze cooked French Toast Casserole for up to 3 months. To cook, remove casserole from freezer day before you want to serve. Allow the casserole to thaw overnight. Remove plastic wrap, but cover with foil and then reheat at 350 degrees for 20 minutes or until warmed through. To cook French Toast Casserole from frozen, remove plastic wrap, recover with foil and bake at 350 for 1 hour. Remove foil and cook an additional 15 minutes, or until breakfast casserole is warmed through. Can you Make French Toast Casserole Without Overnight Preparation? Yes, you can make French Toast Casserole without overnight preparation. French Toast Casserole is best when given time for the bread to soak up the delicious custard, hence why overnight preparation is best. To skip the overnight step, make casserole as directed and after pouring custard over bread, use your hands to push bread down, fully submerging in custard. Let sit for 15 minutes, push bread down again and then bake as for 35 minutes instead of 45 minutes. Remember the casserole will not be as fluffy this way. How to Reheat French Toast Casserole? You can reheat already cooked French Toast Casserole by either individually slicing and microwaving for 1 minute per serving. Or place casserole covered with foil in 325 degree oven for 30 minutes until warmed through. How do I Make Gluten-Free French Toast Casserole? You can make Gluten-Free French Toast Casserole by following my instructions exactly, except for swapping out the bread for your favorite thick gluten-free bread. How do I make Dairy-Free French Toast Casserole? To make Dairy-Free French Toast Casserole, use almond milk or coconut milk in place of cow’s milk. I personally have tried both with delicious results. I highly recommend canned coconut milk for Dairy-Free French Toast as it is rich and decadent. Instead of greasing the pan with butter, use coconut oil or a non-dairy butter substitute. What if my casserole is soggy? Chances are if your casserole is soggy, you did not use enough bread or your bread was too fresh (soft) to absorb the egg custard. To prevent this from happening, after your casserole has set overnight in the fridge, be sure that most the custard is absorbed before baking, if you have more than 1/2 cup liquid not absorbed by the bread, you may want to drain off a bit of that custard before baking. A simple french toast bake made with healthier swaps. See notes for gluten-free and dairy-free options. Grease a 9x13 baking dish with 1 tablespoon butter. Place cubed bread in prepared casserole dish. Mix together eggs, maple syrup, milk, vanilla, salt, cinnamon and nutmeg. Pour custard over bread, lightly tapping bread down to be fully sumberged in custard. Cover casserole with plastic wrap and refridgerate for 8 hours or overnight. To Bake, preheat oven to 350 degrees. Remove plastic wrap and cover with foil. Bake covered for 30 minutes. Remove foil and bake for additional 15 minutes. Serve warm with glaze and/or additional maple syrup. Whisk together milk, salt and vanilla. Add in powdered sugar and whisk until thin glaze forms. Add in more milk 1 teaspoon at a time, if needed to thin out. 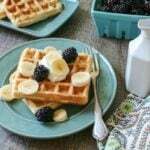 I love/need easy breakfast recipes like this, especially around the holidays! How many eggs are required? I want to try this great recipe this weekend? Thanks! Easy breakfasts like this are my favorite! And that vanilla glaze is drool-worthy! Thanks Aimee–that vanilla glaze is key for sure. This would just be perfect for an Easter brunch!!! This sounds great for indulge myself in three weeks time! I will be on Holiday! after long waited 11 weeks of school term. Thank you for the great recipe. I am so glad you enjoy this recipe Shiho! Enjoy your holiday as well. This turned out great! Super easy, too. I used rice milk in place of cow’s milk, and used only a pinch of nutmeg (not a big fan of it). Thank you so much for sharing your experience Noreen! I am so glad you enjoyed the french toast! Can the recipe be doubled? If so, what would the cook time be, & would it still be baked @ 350°? Hi Crystal!! French Toast Casserole can easily be doubled. If making in 9×13 pan, I would suggest making 2 dishes, using 2 9x13s. I have made this dish many times in a larger 12×16 pan and then it needs to bake an additional 15-20 minutes. Thanks Toni! It is one of our favorites! This casserole would be so perfect for Thanksgiving or Christmas morning! Do you think you could double this recipe, make it overnight, and stuff it would cream cheese, and it would still be amazing? Oh the idea of stuffing this french toast with cream cheese is genius Toni! If you double the recipe, you will need to use a really deep casserole dish and bake for at least 20 minutes longer (covered so you don’t burn the top) But I think it is a fabulous idea! This was good but I added more bread and two more eggs. Note- 8 oz is not one pound as the video says to use; thus is the reason why I added more eggs. Oh good catch on the video. I do use about 4 cups bread cubes for 6 eggs–which is between 8-10 ounces bread. For a larger casserole (or using a loaf of french bread which is typically 14 ounces) 8 eggs and a bit more milk is better. Sorry for the confusion. What brownsugar mixture did you use before switching to maple syrup? Hi Joy! You can exchange the maple syrup for brown sugar (so just 1/4 cup). If you like things SUPER sweet use 1/3 cup brown sugar. Enjoy! How many (about) will this serve? I have to cook for 40 and I’m just wondering how many pans to prepare. Thank you, in advance! Hi Tiffany!! 40 is quite the crowd. One casserole makes 8 LARGE servings. So I would say 4 casseroles would be more than enough. If this is for a brunch with several other recipes, I would make 3. Enjoy! Can I use gluten free bread? I just made the first part of this and put it in the fridge to bake tomorrow for our family holiday brunch, so this may be a little preliminary but so far so good I think. It was easy to make and would be hard to screw up so that gets big points from me since I’m a total dope when it comes to cooking. I did leave out the cinnamon because my husband doesn’t like it, and I substituted French toast bread for the brioche bread because Big Y had literal French toast bread so it was too tempting and I couldn’t find brioche bread in any store. I have a good feeling about it though, I think it will be an easy and tasty recipe. YAY!!! 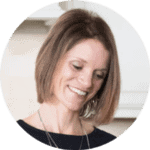 I am so glad you found this recipe to be easy to follow Katie! And the french toast bread sound fabulous!! I hope you enjoy! Can you freeze ahead and cook it on the 5th day? (Going out of town and wanted to bake it once we get back into town). Does it need to be thawed before baking or cook right away frozen? Hi Eliz! I would freeze and then place in refrigerator night before you plan to bake. If that is NOT possible, cook at 350 degrees for 1 hour, covered in foil. Remove foil and bake another 20-30 minutes or until warmed through. Enjoy! can you add cooked sausage to the casserole ingredients? Hi Karen, I have never tried adding sausage to this, but that sounds like a delicious idea. If you try it out, let us know how it works. If using french loaf cubed up how many cups of bread do I do and do I need to change any other ingredients?? (More eggs or milk?) Thanks excited to try this out. Ok perfect so as long as i do the four cups I will be good. One other question I will have a breakfast casserole in oven at 425. Would it be ok to cook this at that temp and just take out sooner? Can this stay in the fridge for 2 nights instead of one? Yes, absolutely. Just be sure to cover well. Enjoy!! I switched the bread to a 1/2 loaf of texas toast. I also switched the maple syrup to molasses. Yum!! I am so glad you enjoyed Jennifer! I cooked it, cooked it more, and more and it never dried out enough to eat. I tried it twice. What am I doing wrong? Hi Davonne. I am sorry you had issues with the French Toast Casserole. Did you fully submerge your bread in the liquid and give it time to absorb before baking? That is my best guess to what may have happened. Either that or a mis-measurement occurred. Sorry about that! I need to make 3 batches of your recipe (looks so good but best of all easy). Could I use 3 – 9×13 pans in the oven at once? What is the best indicator that it is completely cooked through? I would greatly appreciate your feedback. I have been able to make 3 batches for a large brunch before. It really depends on your oven. I place one tray on each rack and rotated the pans to separate racks half way through. My oven worked to cook them perfectly–you will know when the center is set. I hope that helps. DELISH AND EASY. HOWEVER, best to use a glass pan. Baked many pans for a breakfast event and 3 pans were metal and non stick. All were treated with butter or non-stick spray,. All recipes baked in metal pans stuck and hard to remove casserole and didn’t raise as well as glass baked pans. Glass pans were easy remove casserole. Recommend using GLASS PANS. Guests raved about the recipe. I am so glad you and your guests enjoyed Joyce. And yes, the tip for a glass pan is a great one! That is my go to pan as well. Nice pro tip. Do I need to thaw frozen cubed bread prior to assembling or will it naturally thaw and absorb the custard over night? Hi Abbie, the cubes will defrost in the custard overnight, so no need to defrost. Just made this glorious recipe this morning…all 5 of my kiddos loved it. From age 2 to age 8….A definite crowd pleaser. Great recipe! Thanks for sharing! It is always a win when the whole family enjoys! I wanted to know how long to bake for if I can’t make it the night before ? Will I need to adjust any of the liquid measurements since it won’t have as long to absorb the mixture? Wanting to make for lunch for my daycare. I’m so sorry I see your notes at the top now! Hi Amanda! To skip the overnight step, make casserole as directed and after pouring custard over bread, use your hands to push bread down, fully submerging in custard. Let sit for 15 minutes, push bread down again. If you notice more than 1/2 cup extra liquid, drain off 1/3 cup and then bake as for 35 minutes instead of 45 minutes. I hope you all enjoy! I made this last weekend for the family. We all agree that it is a keeper! Thanks for the fabulous recipe! WAHOO!! Love that it is a keeper and family favorite! I’ve always stayed far away from recipes with overnight prep because they always seemed so hard, but this one was so easy that I cannot believe I haven’t tried it sooner! So delicious! I am so glad you enjoyed Karly–and you are right, this is EASY!!! Looks great! Making this tomorrow for a couple of singers I’m hosting this evening. I bought a day-old sourdough loaf because the brioche and french loaf I saw wasn’t kosher and one of the students eats kosher. 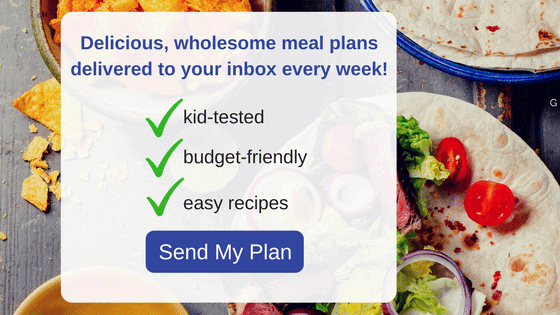 I’ve only got whole milk (other recipes call for half and half or heavy whipping cream, but yours doesn’t–I’m hoping it will still taste good to use just milk? ), and my 9×13 pan is in not so great shape. Would an 8×8 glass pan work? I also bought a couple disposable 9×13’s for $1. Which would be better? Do you recommend increasing the sweetness if using sourdough? So many questions–I’m just miserable at baking even simple stuff (probably bc I end up not having the right ingredients or cook ware!) Thanks for any help! Oh please don’t worry about questions–I am here to help. First, I would use a disposable pan–that way you know it will fit and bake in time. Milk will be perfect–whole milk is best. As for sweeteners–for sourdough you could increase the maple syrup up to 1/3 cup, but I would suggest to serve with syrup on the side and let your company dictate how sweet they want this french toast. Enjoy!!! I only have 1% milk, however I do have buttermilk. Do you think I should use that instead? I would use 1% milk as the buttermilk could over take the flavor of your casserole. I have made this with skim milk in a bind and while not as rich, it turned out. Have you ever made this with raisin bread? If so, what modifications are needed? Thank you! Hi Dori, this is DELICIOUS with raisin bread and you can make as recipe states. Enjoy!